For instance, a child who draws with heavy strokes is usually more assertive than those who use lighter pressure. Children who center their work on the page tend to be more self-directed, self-centered and more emotional in behavior. Those whose drawings are to the right or left of the centre of the page tend to display more uncontrolled, dependent qualities. When words accompany a picture it is because the drawer may fear the drawing is not clear enough in conveying what he wishes to focus attention on. It would be interesting to know what in his past has been misinterpreted in the person’s life. When using colour, moods and memories are evoked. It imbues an atmosphere of either cheerfulness or conveys a dark and somber feeling to a picture revealing their significance and meaning when viewed through symbolism. Colour provides mental and physical stimulation and energy as in the use of red. Too much exposure or use of this colour could trigger aggression, anger or activity, “Red with anger” and yet Red is also used to expresses love and passion as used on a Valentine’s card. Colours reveal their significance and meaning when viewed through symbolism. 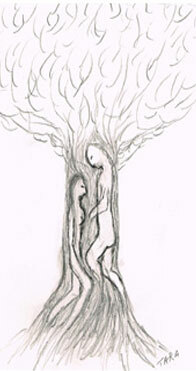 Drawings also reflect perception of self in relation to others. Stress symptoms can be identified through pictures of Family drawings, showing the child’s perceived status within the family hierarchy. Some individuals may reflect their real world of social relationships, while others may express unconscious feelings. Defence mechanisms become apparent in the drawing by separating affect from content. Sometimes affect is repressed or it could be displaced on another object. Pictures expose the inner world,personal to the drawer, where hurt and trauma reside cloaked by everyday activities. By slowly coming to terms with the past the artist can be somewhat free to appreciate the present. The results of my many years of research into the interpretation of drawings was published in November 2014 .